Spacelab long modules and several pallets. In return there would be a flight opportunity for a West-European citizen aboard the first flight Spacelab 1. Three Europeans - Wubbo Ockels (The Netherlands), Claude Nicollier (Switzerland) and Ulf Merbold (West-Germany) - were selected as candidates for the position aboard Spacelab 1. NASA nominated Michael Lampton and Byron Lichtenberg as American scientists to join the group. 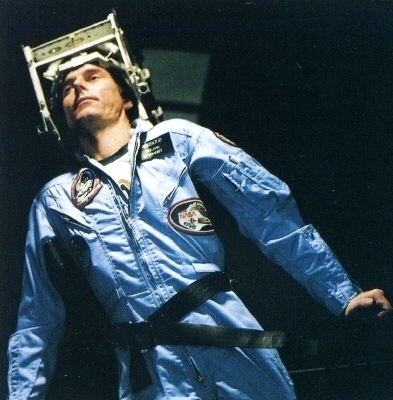 Since West-Germany had assumed project leadership and contributed more than half of the 850 million US dollars for Spacelab, it was not really a surprise that Ulf Merbold finally became the first non-American to launch into space aboard a U.S. spacecraft. Wubbo Ockels was nominated as possible backup. 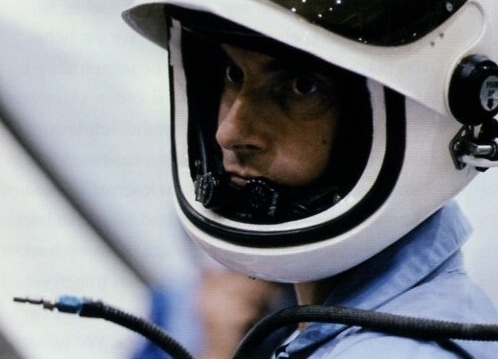 NASA put Byron Lichtenberg into the second PS seat aboard Spacelab 1, with Michael Lampton as backup. All selected Spacelab science astronauts would support Merbold and Lichtenberg during training and flight operations. Since most Spacelab training took place at Marshall Space Flight Center in Huntsville, Merbold and his family - his wife Birgit (a school teacher) and their children Susanne and Hannes - temporarily moved to the US. During OPF operations for STS-9 Columbia finally received a galley. Columbia took this journey twice, since she had to be rolled back to the VAB after an anomaly surfaced on one of the SRB nozzles of the just returned STS-8 mission. One of the SRB nozzles on STS-9 had been applied with the same flawed insulation material, that had nearly burned through during Challenger's mission in August 1983. A replacement was ordered and the launch of STS-9 had to be delayed until November 28, 1983. STS-9 had originally targeted a September launch date, but already had to be pushed into October, because the TDRS-A data-relay satellite - which was essential for the Spacelab mission - had not been operational in time. Originally even the second TDRS should have been launched on STS-8, but technical troubles with the IUS during STS-6 in April had prevented that. 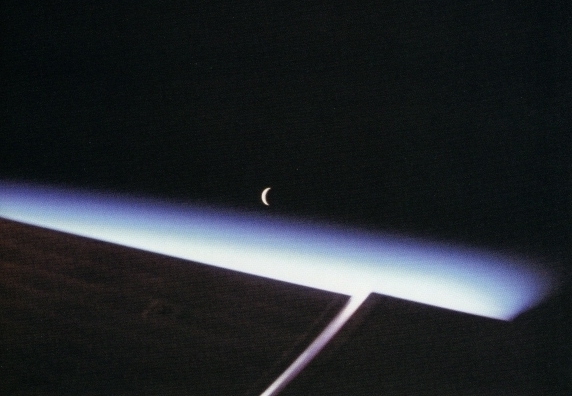 With STS-9 moving into late November/early December 1983, planned earth observation tasks from Columbia's high inclination orbit (57 degrees) would now suffer from reduced lighting in the northern hemisphere. Thank-you for all your screenshots thusfar of the shuttle missions!! One day before the planned launch nothing was certain. Bad weather over the US Southeast and at Zaragoza, Spain, one of the planned TAL sites, threatened another delay. If Columbia would not leave the pad until December 1, the launch had to be delayed until late February 1984, in order to minimize effects on the scientific return of planned earth observation and astronomy experiments. You are welcome. I'm glad you are enjoying it. Each time we send a mission to space, we enter an area stretching millions of miles beyond the surface of the Earth. This effort is the focus of the hopes, dreams and daring of innumerable men and women who have made it the last great frontier of human endeavor. As we seek to conquer this frontier, we stand on the shoulders of giants of science out of the past whose scientific knowledge, like science itself, knows no international boundaries. It is most fitting then, that this ninth Space Shuttle mission, a true international cooperative endeavor, be devoted solely to the pursuit of increased scientific information in orbit. Spacelab, which will orbit the earth in the Shuttle's cargo bay, is the first full-scale scientific laboratory to go into space. It was funded, developed, and built by the European Space Agency. I congratulate our European friends on this magnificent achievement. A dedicated team of European scientists and engineers worked ten years to complete it. The United States is proud to be a partner in what is the largest international space project in history. We send our best wishes to the crew of the Columbia as they set out on their journey. 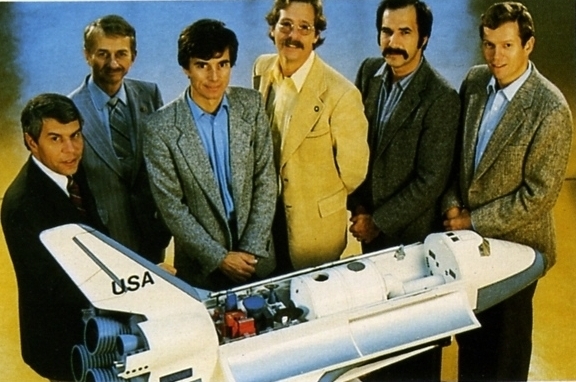 May Captain John Young and Pilot Brewster Shaw, Mission Specialists Owen Garriott and Bob Parker, and Payload Specialists Ulf Merbold of ESA and Byron Lichtenberg all have a successful mission. Bon voyage and God bless you. PAO: T-1 minute and counting. The hydrogen igniters under the orbiter’s engines have now been armed. These devices are used to ensure that any hydrogen flowing through the engines prior to ignition does not accumulate… T-45 seconds, 14 seconds away from switching command to the onboard computers. The Spacelab countdown is now complete. Coming up on the 30 second point. And we go for auto-sequence start. The SRB hydraulic power units have started. These move the solid motor nozzles to steer the vehicle. CapCom: Columbia, Houston, you are go at throttle up. PAO: Throttling up from 85% back to the 488,000 lbs of thrust that each of Columbia’s new engines has… 13 miles altitude, ten miles downrange. Each of the three fuel cells producing 7.8, 7.2 and 7.2 kilowatts respectively. 20 miles altitude, 18 miles downrange, velocity 4163 feet per second. Young: Pc less than 50. CapCom: Roger on the pc. PAO: SRBs have separated. SRB engines have pulled away from the spacecraft at this time. "That is really some ride, I want to tell you. It hadn't changed a bit. It's the smoothest way to fly you ever saw." With the Ku-band antenna Columbia was in contact with the ground for about one half of every orbit - thanks to the additional capacity provided by TDRS-A. On their fourth lap around the earth, Columbia astronauts had a bit of a struggle opening the airlock hatch leading to their space laboratory. But with the right amount of patience, force - and a swiss army knife - they succeded at last. CapCom (Franklin Chang-Diaz): And Columbia, Houston, we can see you coming down the tunnel. You’ve got about 11 and a half more minutes of TV coverage. Welcome to Spacelab. Garriott: Okay, we are just moving into Spacelab right now. PAO: Left in the field of view mission specialist Owen Garriott and to the right payload specialist Byron Lichtenberg, followed by European Space Agency’s payload specialist Ulf Merbold… now in the Spacelab module for the first time. But there wasn't much time for celebration - 72 Experiments in the areas of life sciences, materials science, Earth observation, astronomy and atmospheric physics stood on the agenda. In order to maximise the resulting amount of data, the astronauts worked 24/7 in two shifts. The "Red Team" consisted of CDR John Young, MS2 Robert Parker and PS1 Ulf Merbold, the "Blue Team" of PLT Brewster Shaw, MS1 Owen Garriott and PS2 Byron Lichtenberg. 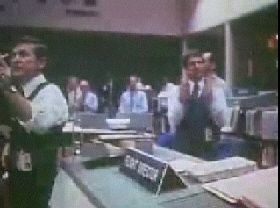 A second Mission Control, responsible for all scientific aspects of the mission, had been established at Johnson Space Center. In addition to the POCC (Payloads Operations Control Center) project scientists at Marshall Space Flight Center in Huntsville and at Oberpfaffenhofen near Munich in West-Germany had the chance to follow their experiments and sometimes speak directly to the astronauts. POCC: …Spacelab, we can see experiment 22 come cranking out of Spacelab… really good real time shot. PAO: Standing by for retraction of experiment 22, the wide-field camera, which has been photographing ultra-violet emissions from various astronomical sources during this night pass of the orbit. It must be retracted into the cell and the cover closed to protect the camera during the daylight portion of the orbit. PAO: The orbiter passing now off the coast of Canada into the Atlantic Ocean… continuing to receive live downlink television. POCC: Spacelab, Marshall Ops for Byron. POCC: Yeah, we are getting some really spectacular video downlinks from the payload bay cameras. You guys just passed over Hudson Bay we believe. And I guess we are seeing a lot of cloud patterns over Hudson Bay. Just before that we were seeing large bodies of water. Lichtenberg: Roger, we copy the same thing. I’ve got it onto my home movie 16mm-film also. The German Minister of Science and Technology, Heinz Riesenhuber, and the US ambassador to Germany, Arthur Burns, had been talking to Ulf Merbold earlier in the morning. Now during the afternoon their bosses took over during an international conference call: Helmut Kohl at the European Community Summit in Athens, Greece, Ronald Reagan at the White House in Washington D.C., Johnson Space Center in Houston, Texas, and the astronauts aboard the Columbia. 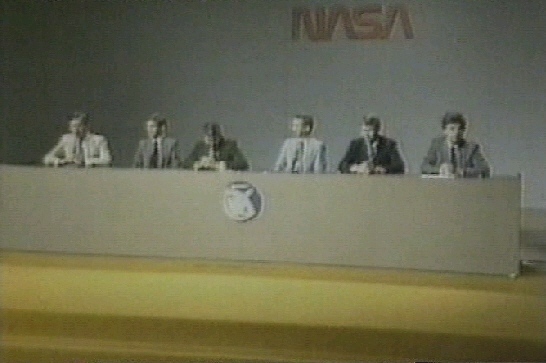 Later journalists from Bonn/Germany, Brussels/Belgium, DenHaag/The Netherlands, Geneva/Switzerland, Rome/Italy and London/UK had the chance to ask the crew about their experiences during this first Spacelab mission. 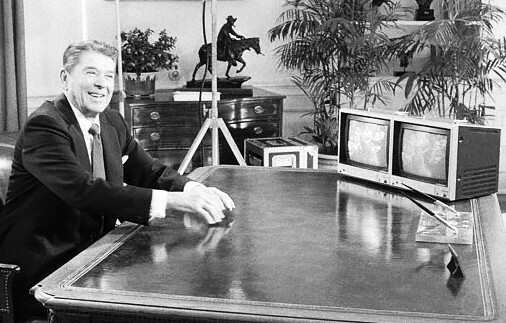 Reagan: Greetings from Washington. Chancellor Kohl is with us all the way from Athens, Greece. Along with you astronauts hovering in space with me here in Washington and the whole world listening, this is one heck of a conference call. Reagan: Seriously though, this Space Shuttle mission represents the enormous potential available to mankind. The Spacelab, in which the experiments are carried out, was designed and built by the European Space Agency. The Federal Republic of Germany and other European contributors can be especially proud of this achievement. Reagan: It is fitting, that on this the German/American tricentennial, a German astronaut is part of the Shuttle team. The Shuttle is demonstrating that technology can be used to bring people together in a new spirit of enterprise and cooperation to better their lives and ensure the peace of mankind. I know Chancellor Kohl agrees with me that this Shuttle mission, with it’s German and American crew, represents the highest aspirations of our two people. Chancellor Kohl, this is a great day. Perhaps you could give us your thoughts on this marvelous occasion. Kohl (in German/translated): Thank you very much, Mr. President. It is a terrific experience for us to be able to talk together this way and to talk to the crew as well. Above all I want to send my best wishes to my countryman. Dear Mr. Merbold, I would like to take this opportunity to assure you and your colleagues, your team members, that I and all countrymen in Germany have with great excitement and pride been following your flight for days now. We are proud indeed, that your participation in this highly successful experiment is at this time demonstrating in such an impressive way the close ties between Europe and the United States. Kohl: And that this mission shows once again that we Europeans are in fact able to stand the test in terms of technology of the future. This US/European Shuttle mission is indeed a convincing proof of the closeness of Europe and the United States. Kohl: President Reagan has already pointed out that it is an exceedingly happy circumstance – of which of course we are very much aware – that it is possible to have a German scientist, a European astronaut, as a member of the crew at this particular time of the tricentennial celebrations of German/American relations – remembering the time when the first Germans came to the United States. 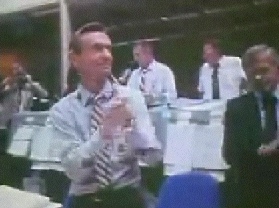 Reagan and Kohl then for about 15 minutes spoke directly to the astronauts, who in turn showed them the inside of Spacelab and the Shuttle middeck and reported how successful this mission had been so far. Then the U.S. President brought this part of the conference call to a close. Reagan: I thank Chancellor Kohl, and thank you all of our astronauts. God bless you and Godspeed on your journey home. John Young not only was the commander of this mission - he also was "chef de cuisine", using Columbia's brand new galley. PAO: And the crew coming down the walkway now. And a good round of applause from Mission Control flight controllers. 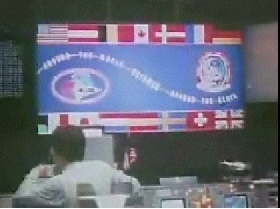 PAO: Very precarious position in placing the plaque alongside that of STS-8 and the other shuttle missions on the left wall. The whole world is delighted to see Columbia and Spacelab back on the ground, safe and sound after a truly successful 10-day adventure. Our congratulations to the entire shuttle team - the astronauts as well as the thousands on the ground who made this mission possible. In particular, I want to thank the dean of American astronauts, Commander John Young, our German friend, Ulf Merbold, the European Space Agency, and all the folks at NASA. Well done! Your great success is a shining example of what free people working together can do. This cooperative effort between Americans and Europeans will add to our treasure of human knowledge and be put to practical use, improving our lives on Earth. New horizons have been discovered and old boundaries pushed back. It proves that there's never a time when we should stop dreaming. We will continue to challenge our imagination and aim high. The ultimate frontier of space will be a quest for mankind's highest aspirations - the opportunity for individuals, cooperation among nations, and peace on Earth. ... the other four crewmembers had to perform additional tasks in the name of life sciences. Here some pictures of Ulf Merbold repeating experiments already performed in space - this time in a 1g environment. But the four astronauts even returned to zero g for a short period of time - aboard the KC-135 "Vomit Comet". Scientists wanted as much data as possible in order to understand changes to the human body in space - and upon return to earth. 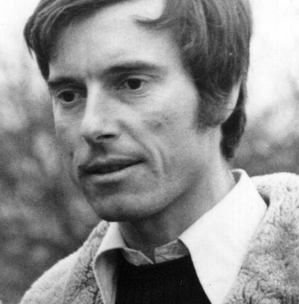 The President of the Federal Republic of Germany, Karl Carstens, and Chancellor Helmut Kohl invited him, as did Lothar Späth, Governor of Merbolds homestate Baden-Wuerttemberg. Here at the provincial capital Stuttgart "Our Ulf" received the Order of Merit of Baden-Wuerttemberg. Ulf Merbold received the First Class Order of Merit, the highest civil medal awarded by the Federal Republic of Germany, from the hands of the Minister of Science and Technology, Heinz Riesenhuber. 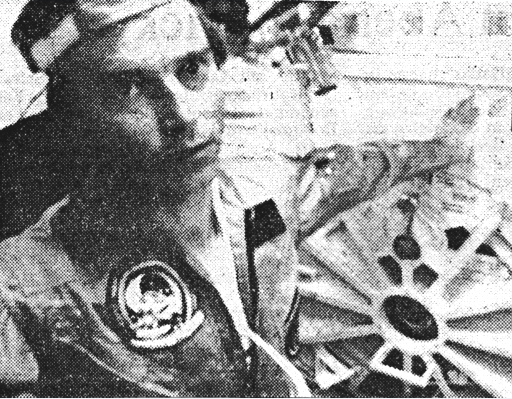 As I said at the beginning of this thread, communist East-Germany had put their own man into space aboard a Soviet Intercosmos mission to the Salyut 6 space station in 1978. Here some pictures of this flight.